DesignFOIL includes a preliminary analysis tool called the Virtual Wind Tunnel. Many people ask how accurate it is. As with all computational fluid dynamics software, the answer is "it depends". In fact, it depends on how you measure accuracy. Lift coefficient? Maximum lift coefficient? Drag coefficients? It all comes down to what you, the user, requires as a level of accuracy. Rest assured that you will find DesignFOIL, in general, acceptably accurate for most preliminary airfoil analysis. One caveat is that DesignFOIL tends to overpredict lift coefficients for airfoils with very high camber and the pitching moment on these airfoils has a noticable slope. To see what I mean by accuracy, this page includes several DesignFOIL examples and discussion. Feel free to use the demo to run as many comparisons as are needed to satisfy your requirements of accuracy. Regardless of how you create your airfoil, you must ultimately verify its performance in a real wind tunnel before it is used on a project. I highly recommend the Aero/Astro Research Lab at the Ohio State University. 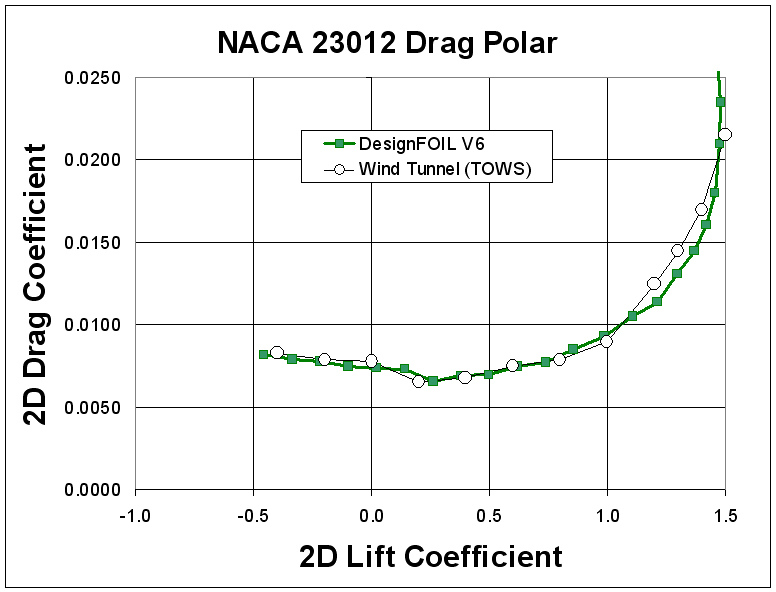 This chart contains a comparison of DesignFOIL V6 and wind tunnel data for the NACA 23012 airfoil. Click on the chart to view a larger version. This is an example of how stunningly accurate DesignFOIL can be. The lift and drag coefficients follow the same trends and the slight drop at around zero lift coefficient is clearly shown in the predictions. Although not shown, the pitching moment is also very close (within 10%). 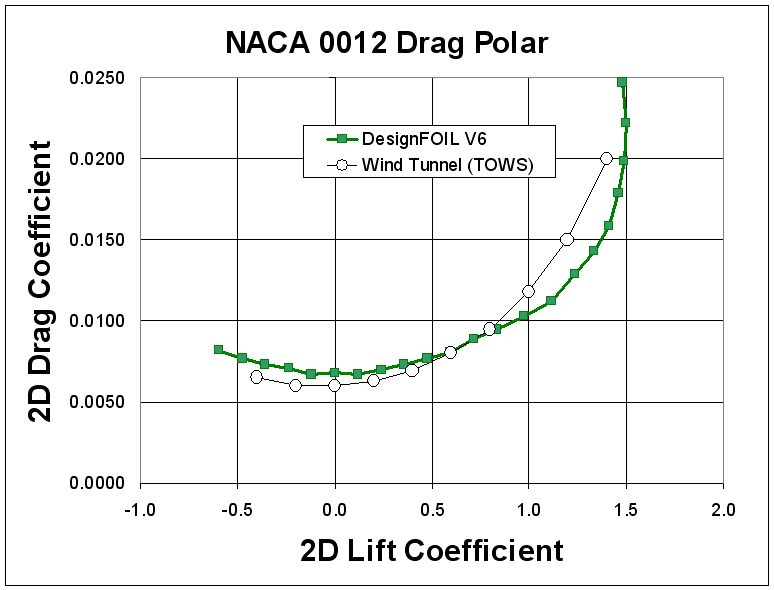 This chart contains a comparison of DesignFOIL V6 and wind tunnel data for the NACA 0012 airfoil, possibly the most commonly used airfoil in history. Click on the chart to view a larger version. As you can see, this drag polar varies a bit more than the NACA 23012. So, the accuracy will vary from airfoil to airfoil. Generally, DesignFOIL predicts more drag at low lift coefficients and less at higher lift coefficients before stall. As in the previous airfoil, the pitching moment coefficient is extremely accurate. 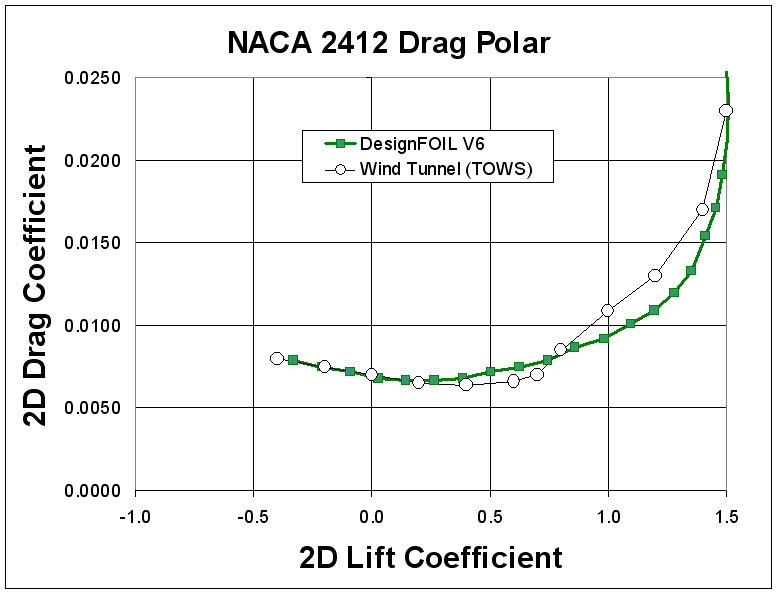 This chart contains a comparison of DesignFOIL V6 and wind tunnel data for the NACA 2412 airfoil, commonly used on general aviation aircraft. Click on the chart to view a larger version. As you can see, this drag polar varies a little bit from the wind tunnel. It accurately predicts the drag at low lift coefficients but tends to underpredict at higher lift coefficients. Still very acceptable for preliminary airfoil analysis. 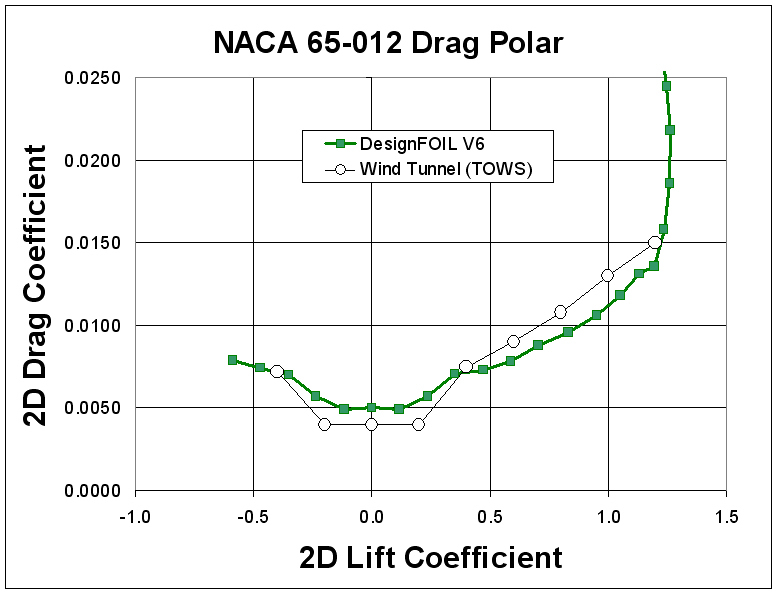 This chart contains a comparison of DesignFOIL V6 and wind tunnel data for the NACA 65-012 airfoil. Click on the chart to view a larger version. One of the great things about DesignFOIL is that it captures laminar drag buckets relatively well. Generally, the width is quite accurate with a slight overprediction of drag (a conservative approach for sure). Still very acceptable for preliminary airfoil analysis.